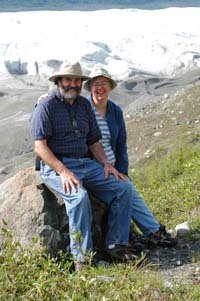 Both Bill and Sue Cassidy are retired teachers (Bill as a second career after working for the government for thirty years) , and both have a passion for photography, particularly nature photography. Bill has a degree in professional photography from Rochester Institute of Technology, making him the true photographer of the pair. Sue has been involved in picture-taking only since the digital revolution. Both love to travel and to see beautiful places, and also love to capture the things they see in photographs. They have had two successful shows of their photos in a small gallery in Baltimore, and participated in many art and craft shows in Maryland, Virginia, and Georgia with their work. When, after retirement, they decided to put their thousands of photos to some use, their daughter suggested they turn it into functional art--and their small business, Teachers With Cameras, was born. They now put their creative talents into creating ceramic and glass coasters, trivets, cutting boards and other objects that can be used daily, and also appreciated for their uniqueness and beauty. This section of our page is now dedicated to the places we have visited, but didn't make a separate page for. It seems to make sense to take them off our main page, and feature them here. After a weather postponement, the Mid Atlantic Fireworks Festival show finally went on Sunday night, April 12. It was ladies' night, and all of the shows were created by the women associated with MAFF. Our Gallery for this event can be found HERE. We traveled south to get away from the frigid temperatures, to see Bill's great niece run in a marathon, and to photograph some beautiful birds. Located in Scotland Neck, North Carolina, this facility features hundreds of amazing birds. Many, like the ducks, are in fairly accessible ponds, while others are easily viewed, but not easily photographed. The facility also features a "Landing Zone" where you can feed parakeets and flamingoes. Needless to say, I took full advantage of this, and enjoyed this great opportunity. We stayed at the Scotland Neck Inn, a pleasant motel with good accommodations. If you head for Scotland Neck, do not miss the delicious food at Le Caseta, an excellent Italian restaurant. Visit our GALLERY to view the photos. We continued south to Jacksonville, where we got a brief stop on the beach. There, we discovered black skimmers hanging out with seagulls and shore birds including turnstones and dunlins. We drove south to St. Augustine, to enjoy the St. Augustine Alligator Farm and the Fountain of Youth. The Alligator Farm is a terrific place to visit, even if you aren't interested in photographing birds. It offers excellent exhibits with hundreds of alligators, other crocodilians, lemurs, exotic birds, and lots of other animals. We went for the wading bird rookery that surrounds the main alligator lake. While we were early for the mating season, the birds were arriving, and we got lots of shots of roseate spoonbills, great egrets, and ibises, as well as both varieties of night herons. The Fountain of youth was historically important, and we found lots of photo opportunities there, too, especially the beautiful peacocks. Catch our photos on this GALLERY. A terrific place to eat in St. Augustine is Bonez, a newly opened BBQ spot with great service and excellent food. Merritt Island National Wildlife Refuge, in Melbourne FL, is a gem! It offers dozens of species of wading birds, ducks, shore birds, pelicans, raptors, alligators, and maybe even manatees. (we didn't see any, but in Spring and Fall they are supposed to be there.) Feeders located at the visitors' center offer opportunities to get photos of male and female painted buntings. Most of the other birds were easily accessible for photographs from the loop road, and there are several trails for hiking. Harris Neck NWR, located south of Savannah, GA, has lots of potential, but the day we were there it was freezing cold, so the birds were all huddled in trees--and we huddled in the car! Our photos of these refuges are available in this GALLERY. Spring is here, and so is our 2015 show season. This listing is tentative, since there are some shows that we are waiting for confirmation, so some will probably be added later. We hope to see you this year at some of our shows. Remember that you can view our work and order from us--either our photos or yours--by going to the Photo Products Page on this site. Also, most of the photos in our other galleries can also be made into tiles or other items. We have added a gallery of jar lid openers to make ordering them easier. They are $2.50 each. This has been a particularly good year for feeder birds at our house this winter--particularly since we have a fantastic new lens to play with. Here is a gallery of some of the photos of our feathered friends. In July we set off again (by train) to visit Glacier National Park for the second time. This time, the train was on time and we arrived at the Mountain Pine Motel to join our friends in exploring this beautivul national park once more. A big difference in the park was readily apparent--much more snow and ice on the mountains and trails. We saw many more bears munching on berries and digging for grubs and ants right along the roadside. We also saw more deer, goats, and ground squirrels, but only one moose and no big horn sheep. The wildflowers were gorgeous. We drove to Waterton Lakes, Glacier's sister-park in Canada for a day, and got a look at the Canadian Rockies and a small herd of bison. We had a wonderful time and brought back thousands of photos, only a few of which we are sharing in our gallery. Once again we journeyed to Bethany Beach to spend a few days photographing hummingbirds on Marilyn's and Ray's porch, where they have created a haven for these lovely little fliers. Please click here to see this year's hummingbird gallery. On the weekend of April 11, we made our first--but certainly not our last--trip to Great Smoky Mountains National Park. This is a perfectly beautiful national park--and a perfectly beautiful place. We participated in a photography workshop led by Wilson Reynolds, April Love, and Brett Wells. Sponsored by f32 Photography in Knoxville, Tennessee, the workshop's subjects were the spring wildflowers the Smokies are famous for. The forest floor was literally carpeted with flowers of all kinds, with trilliums the stars of the show. We also photographed the night sky, flowing water, all kinds of scenery, and a few critters on the side. Many thanks also go out to the Tremont Outdoor Resort for a pleasant stay in Cabin 1. Visit our GALLERY to see some of our photos. This year's MAFF show was great, as usual. We took 700-plus photos between us, and we chose a group of the highlights to put in the gallery. The weather was excellent, if a bit chilly, and the sunset over Allen's Fresh was awesome. The fireworks were like great flowers blossoming in the black sky. We shot a lot of our photos from a distance, and then we moved up to the front row for the final program. That is the closest I have ever been to fireworks, and I loved it! Bill was busy shooting some great photos, but I just enjoyed. We recently had the opportunity to visit Zootastic, a facility dedicated to educating people about the world of animals by encouraging hands-on and up-close experiences. Please click here to view our gallery. Thanks to the hospitality of owner Scotty Brown and his staff, we were able to photograph many animals "up close and personal". This was an excellent experience, and we want to thank everyone who helped us, and particularly Kortney for her assistance with the baby lemurs, goats, kangaroo, wolf cub Dakota, and the two tiger cubs, Jafar and Geni. If you are ever in the Charlotte, NC area, or even somewhere close, visit Zootastic. It is definitely worth the trip! We have created a whole series of new galleries that represent the photos now available on our tiles. We hope you enjoy checking them out.